On the 4th of September 2013 the celebration of the Jewish New Year (Rosh Ha'shana) started and I was invited for the evening to my friends. I took one of the last trains going from Tel Aviv before the festival. The rule is that during the festivals no trains and no public transportation works in Israel. If you don't have a car - you are stuck in the middle of nowhere. I was really afraid to miss the last train so I went a little bit earlier even if I was still in the middle of shopping. 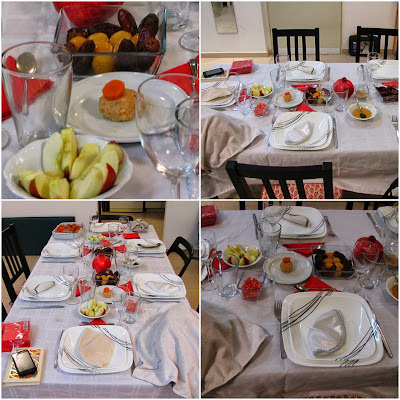 When I arrived my friends had everything prepared and the food was SWEET. It's a custom to eat a lot of sweet stuff, like apples with honey - to wish each other a sweet and good year. So happy New Year, shana tova u'metuka - let it be as interesting as my last was.